2018 Indian Roadmaster Elite. Picture credits - Indian. Submit more pictures. This ultra-premium touring machine features custom-inspired two-tone candy paint that takes 30 hours to complete and is finished by hand. It�s even embellished with real 23K gold leaf badging on the tank and lowers. Instruments: Fairing mounted instrument cluster featuring analog speedometer and tachometer, with fuel gauge, range, odometer and current gear. Carrying capacity: Hard saddle bags. Top box. Glove Box. 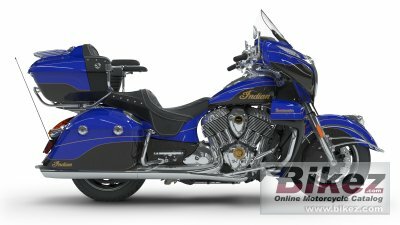 Ask questions Join the 18 Indian Roadmaster Elite discussion group or the general Indian discussion group. Bikez has discussion forums for every bike. View comments, questions and answers at the 2018 Indian Roadmaster Elite discussion group. You can sign up for e-mail notifications when other riders answer you. If you have extensive experience with the MC, please send us a review. If you consider buying this bike, you should view the list of related motorbikes Look at photos. Compare technical specs. And check out the rating of the bike's engine performance, reliability, repair costs, etc. You can compare the rating with other bikes.